I love shooting brides and groom in vineyards, and the Malibu Family Wines property Saddlerock Ranch provided the perfect collection of vineyards for this sweet wedding portrait. This bride and groom had an Indian wedding ceremony that included both Hindu and Sri Lankan traditions. Sri Lankan brides traditionally wear white saris, and this bride's sari (or saree) featured a dazzling array of intricate bead work. The bride changed into a beautiful red lengha for her outdoor reception, while the groom changed into a tux. Adding to this groom's fun look was the fact that he wore glasses. I've had several Indian grooms who wore glasses, and I always think it looks great. Tai the Elephant (from Have Trunk Will Travel) made an appearance at the groom's baraat, and the ceremony took place under a gorgeous tree on the Saddlerock Ranch lawn. The reception took place under stars and twinkle lights hanging from huge trees, with beautiful florals arrangements in brown, cream and rusy courtesy M's Flowers. 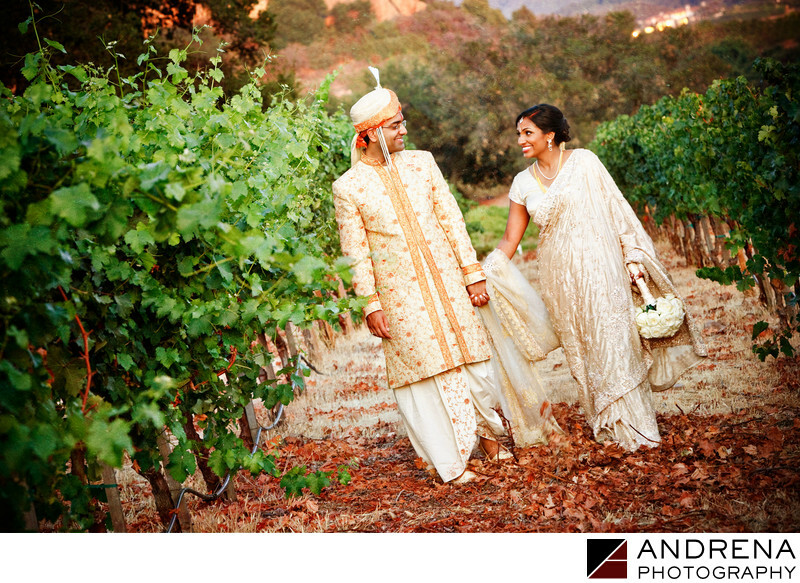 Indian and Sri Lankan wedding photographed at Saddlerock Ranch and Malibu Family Wines in Malibu, California.